If Conway willingly violated the law, she could face up to five years in prison for each offense. Kellyanne Conway leaves a meeting of the House Republican caucus at the U.S. Capitol on March 23 in Washington. The top Democrat on the House Oversight Committee is asking the D.C. consulting firm founded by Kellyanne Conway for more information about her current relationship with the company. The letter, sent Tuesday by the panel’s ranking member, Rep. Elijah Cummings, follows a Slate investigation earlier this year that uncovered evidence suggesting that Conway retained ownership of the Polling Company even after she took an official position in the White House as a counselor to the president. “Based on public reports to date, it does not appear that Ms. Conway has divested her ownership interest in The Polling Company, raising questions about whether she has conflicts of interest on matters relating to the company’s current, former, or prospective clients,” Cummings wrote to Brett Loyd, who took over as CEO of the firm after Conway officially stepped aside to follow Donald Trump to the White House in January. As I explained in March, if Conway is taking an active role in White House decision-making that directly affects the fortunes of her firm’s clients, she may be committing a federal crime punishable with prison time. Under the basic criminal conflict of interest statute (18 U.S.C. § 208)—which doesn’t apply to the president but does apply to his staff—it is illegal for an executive branch employee to participate “personally and substantially” in any government matter that will affect his or her own financial interests. In effect, the law requires an administration employee to either sell her business or recuse herself from policy matters that directly impact that business. There’s no evidence that Conway has done either. During my digging, I found nothing to suggest that Conway had even begun what can be a monthslong process of obtaining a certificate from OGE. The same was true when Cummings checked with OGE in April—and when Slate made independent inquiries with OGE last week. According to the ethics office, officials there are not aware of any issues Conway has recused herself from since taking office—and have no way of knowing whether the White House has granted her an ethics waiver since the administration has decided to keep such waivers secret. 1.) Does Ms. Conway have any current ownership interest in The Polling Company? If so, please provide information on the type and scope of that ownership interest. If not, please provide the final dates on which she divested her ownership interests. 2.) 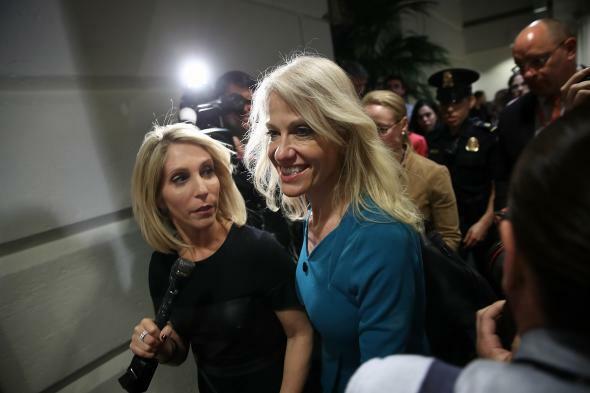 Has Ms. Conway ever informed The Polling Company or any of its clients that she is recused from working on any matters that may affect their interests or that she has obtained a waiver of this requirement? If so, please provide all documents and communications referring or relating to Ms. Conway’s recusal or waiver. 3.) Since January 20, 2017, has Ms. Conway provided advice or any other service to The Polling Company or any of its clients on any matter? If so, please provide the name of the clients, the subject matter of the advice or other service, and the date of the advice or other service, along with all documents and communications referring or relating to the advice or service. 4.) Did Ms. Conway exercise any decision-making authority after January 20, 2017, with respect to any aspect of The Polling Company’s business, operations, or ownership? If so, please describe those actions and produce all documents and communications referring or relating to the exercise of this decision-making authority. 5.) Please provide a list of the Polling Company’s current clients. 6.) On what date was Ms. Conway designated as Director of The Polling Company? What responsibilities are associated with this title and role? 7) Does Ms. Conway continue to hold the position of Director? If not, on what date did she resign from this position? 8) What is Ms. Conway’s current title, if any, at The Polling Company, and what are her current authorities? Please all provide all communications between Ms. Conway or her representatives and The Polling Company concerning her current authorities. Neither the Polling Company nor the White House immediately responded to my requests for comment after Cummings went public with his letter on Tuesday. If a court were to find Conway willingly violated that law, she could face up to five years in prison and $50,000 in fines for each offense. You can read the original Slate investigation here. Know anything about the Polling Company or any other potential conflicts of interest in the Trump administration? DM Josh Voorhees on Twitter or email him at josh.voorhees@slate.com.